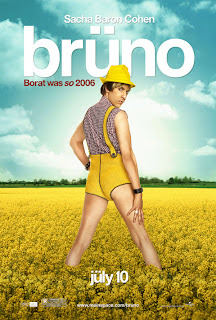 Accoring to preliminary reports, Sacha Baron Cohen's BRUNO is Number 1 at the box office this opening weekend much to the consternation of the Christian Film & Television Commission. Yes, good old Ted Baehr and his fellow inquisitors have anointed BRUNO the most "abhorrent" film of the year, calling it "mindlessly pornographic, politically correct paganism" and "worse than any decent human being can imagine." Hey, that sounds like my kind of film! But, while BRUNO pushes more envelopes than the U. S. Post Office, most end up in the dead letter file thanks to a screenplay that is so shoddily constructed you would think Kaufman & Broad had written it. After a surprisingly slow start in Austria, the various contrived scenes go downhill faster than Franz Klammer on the Hahenkamm at Kitzbuehl. Things pick up, slightly, when the title character reaches Los Angeles, but even at a relatively short 82 minutes, Sacha's sashaying grew tiresome and I found myself longing for The Village People or Bruce Vilanch or Paul Lynde, even Topo Gigio. 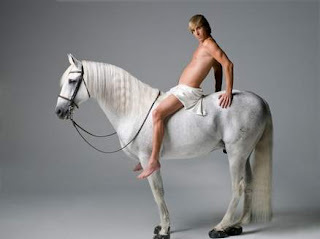 There are a few bright moments, such as the segment at an Arkansas wrestling arena where the local red-necks, looking like Beluga whales in cheesy t-shirts, become mortified at the homo heat taking place in the rink between Bruno and his sycophant assistant, Lutz (played by Gustaf Hammarsten). And the clips from his appearance on The Richard Bey Show in Dallas, where he introduces his adopted black baby as "O.J." (claiming it is a traditional African name), is priceless. How Cohen manages to escape both the Pig Sooie state and Big D alive is beyond me. How he managed to escape the dreaded NC-17 rating is also perplexing. BRUNO may be rated R -- but it is a hard R, a virtual diamond-cutter of an R to be precise. Yet, for every little comedic gem, there are several sequences that misfire as often as a Vanguard rocket. For someone who is Cambridge educated, how in the world did Sacha Baron Cohen think his Ron Paul interview was going to be funny? Wouldn't Senator Larry Craig have been a better choice? Even the much ballyhooed closing song featuring Baron singing his own unique version of "We Are The World" with such luminaries as Bono, Slash, Snoop Dog, Chris Martin, Sting and Elton John disappoints. Unfortunately, BRUNO isn't anywhere near as entertaining or as funny as BORAT, and while BRUNO rules the box office this weekend, we predict ticket sales will nosedive like a Stuka once the word gets out. Wanna bet?